Nissan Motorsport has shaken down its brand-new Nissan GT-R NISMO GT3 ahead of the 2017 Liqui-Moly Bathurst 12 Hour next weekend. The car landed in Australia last week after its build was completed at NISMO headquarters in Japan. 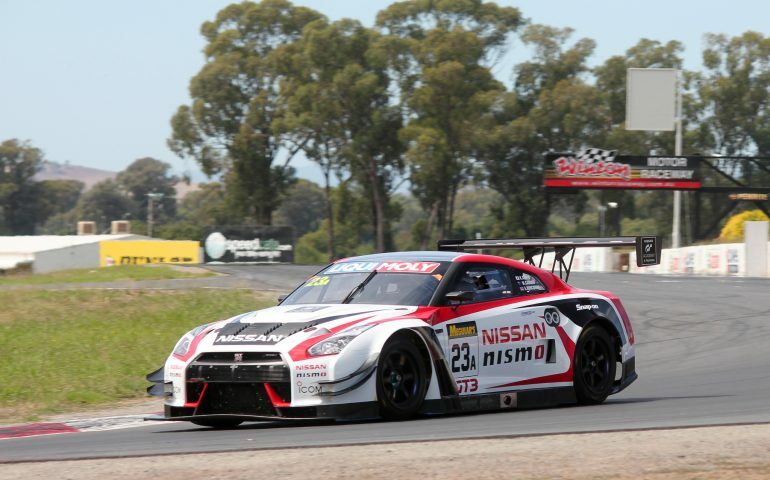 Nissan Bathurst 12 Hour drivers Michael Caruso and Todd Kelly were at Winton yesterday to give the GT-R NISMO GT3 its first track laps, with drivers and team enjoying a trouble-free day. “It’s great to be the first driver to jump in this Nissan GT-R NISMO GT3, delivered only a week ago from NISMO,” said Michael Caruso. “Having not driven a GT-R for a few months, it’s great to prepare myself and I’m getting excited for Bathurst. “Today is all about doing a shakedown with the brand-new car. We did a few installation laps, doing a few system checks and it has been running great. “The car gets delivered from NISMO in A1 condition and we will go to Bathurst in the best shape. The shakedown was Todd Kelly’s first-ever drive of a GT3-specification car ahead of his Bathurst 12 Hour debut. “I’ve just had my first drive of the GT-R NISMO GT3, and to be honest, the whole day is almost surreal,” said Todd Kelly. “I’ve spent the whole day trying to erase 20-odd years of learning how to drive a race car because the only car I’ve driven in recent times is a Nissan Altima Supercar. The brand-new #23 GT-R NISMO GT3 will be raced at the 12 Hour by Caruso alongside Katsumasa Chiyo and Alex Buncombe. As seen at the shakedown, the car will compete in the traditional Nissan global colour scheme. The #24 GT-R entry, the car that Nissan used to finish second at the 2016 Bathurst 12 Hour, will be driven by Kelly, Jann Mardenborough and 2015 12 Hour champion Florian Strauss. The look of the #24 will be revealed in the coming days.